Is Now a Good Time to Buy or Sell at 3.65%? In February I had the opportunity to join 19,000 other Keller Williams Realtors in Las Vegas for our annual Family Reunion. Gary Keller, the founder of Keller Williams shared all of the research he has compiled about the current market. I always enjoy hearing him discuss current, past and future trends in real estate. A few slides really stood out to me and I want to share with you. For the past few years, I always get the question if now is a good time to buy or sell? The answer is YES! 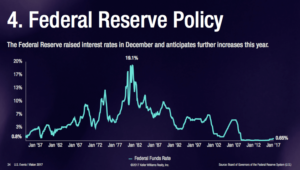 Recently the rates did increase a bit into the 4% range. If you look at the mortgage rates slide below, you can see the 2016 average was 3.65%. The historical rate from 1990-2016 is 6.4%. You can see that the rate is at an all time low. Borrowing money is basically free right now in my eyes. 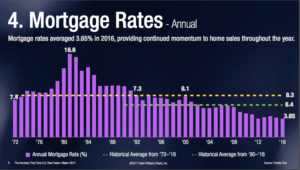 Low rates bring out more buyers. With the low interest rates, this creates a low inventory. Buyers are trying to take advantage of these rates and we are not seeing a balanced market. You can see on the slide below that 6% is considered a balanced market. Below 6% is a seller’s market and above 6% is a buyer’s market. It has been a seller’s market since around 2012. 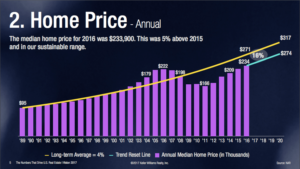 You can also see on the last slide that the median price range in 2016 was $233,900. This was a 5% increase from 2015. 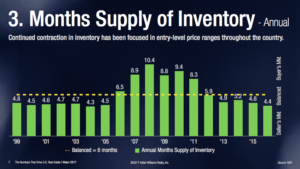 As as a potential seller, now is a great time to take advantage of the low inventory (less competition) and low interest rates. Buyers see these slides and worry that the prices have increased too fast. However, you can see that the long term average was $317,000 and we are still below this. Buyers are still able to buy and keep monthly payments affordable because of the lower interest rates. If you are considering taking advantage of this great market, contact the Peters Company at 404.419.3619 and we can discuss these details in greater depth with you. ← What do sellers look for when choosing an agent?